There are some really awesome spots along the Pittsburgh Marathon Course. As someone who has ran the majority of the course (Half Marathon in 2013, legs 4 and 5 of the Relay in 2014), I have picked out my top 5 places along the course. Will you be running any part of the Pittsburgh Marathon Course in May? Look for these! A few years ago, it would have been a true April Fool’s Joke if I wrote about running a mile, let alone a Half Marathon. Over 110 pounds ago, I set my heart and my head to a goal – to run a Half Marathon. Thing is, I never spoke it until a ‘lil over a year ago when I trained for my first half, the Pittsburgh Half Marathon. Now, there are still times that I don’t think I am really a runner, but I am. My feet move me, my lungs sure feel it, and I have at least five medals to prove it. When I was matched up with Jennifer, I got really excited to be able to share part of my story on her blog. I tossed around a few ideas and decided with a ‘lil of a month to go until the Pittsburgh Marathon, my “Top 5 Places Along the Pittsburgh Marathon Course” would be a fun fit for today. Although I am not doing the Half this year, I’m running two legs of the Marathon Relay and am excited to see my favorite places soon. 5. The starting line. Emotions soar as you inch your way (literally) to the starting line. It’s incredible to be part of such a large group of people — all ages, sizes, races, genders — with one common goal. Music is blasting, people cheering, and cameras snapping. I definitely ran the fastest quarter mile of my life (to that point) as we ran past through the starting line and I waved HEY to my husband. 4. The North Shore. Be ready to smell some amazing bacon wafting through the air from Bistro to Go. Run past PNC Park and the Children’s Museum. The harmonica guy. So much cool Pittsburgh “stuff” to run past. It’s truly part of “running home” (this year’s Marathon Theme). 3. The Birmingham Bridge. This, to me, is the make or break of the race. I made that bridge my “you know what” because I realized that “OMG, bridges are really big hills”. You get to see the city. Half Marathoners will be bracing themselves to go up the hill to Duquesne and saying farewell to the relayers and marathoners. It was definitely a defining moment in my running life. 2. The miles to the finish line. Okay, I haven’t done this yet, but I did some of them during the 10-Miler in November. Fast miles happen here. Crowds in Bloomfield and Lawrenceville are VERY supportive (so I witnessed on the news). The finish line is OH.SO.CLOSE. This is going to be my most exciting part of my experience this year. 1. Anywhere your friends or family are along the course. Greg and I strategically placed where I’d need him to be and scheduled out T-schedules and walk times for him to get to me. At least twice, he got to high five me. When I did the 10-miler, he even pushed the double stroller and had my ‘lil cheerleaders there for me. It really means a lot to have your biggest fans along the course. Don’t have fans? Don’t worry. EVERYONE is there to cheer for you on race day. Are you going to be part of the Marathon Weekend this year? If so, look for me. I’ll be panting, running between 10-12 minute miles, and taking on the hill to Oakland, through my beloved Shadyside (thank you, Chatham College), and down the hill into the finish line. Look for me, or follow @mrsgregwillis for race day updates. 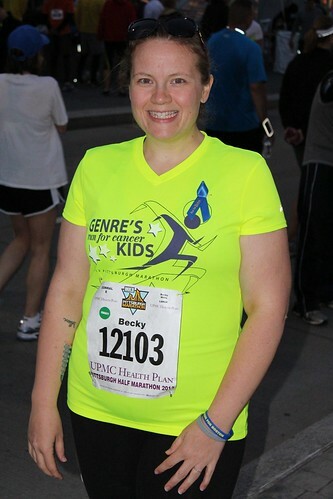 This entry was posted in Becky, Fitness, Pittsburgh Fun, Pittsburgh Marathon, Running. Bookmark the permalink.